Krishanu Saha is an Assistant Professor in the Department of Biomedical Engineering at the University of Wisconsin-Madison. He is also a member of the Wisconsin Institute for Discovery, Carbone Cancer Center, and Stem Cell and Regenerative Medicine Center as well as the National Academies’ Forum on Regenerative Medicine. 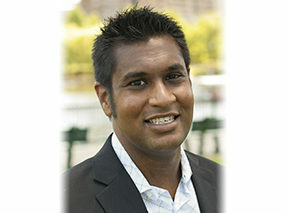 Prior to his arrival in Madison, Dr. Saha studied Chemical Engineering at Cornell University and the University of California in Berkeley. He was a Society in Science: Branco-Weiss fellow at the Whitehead Institute for Biomedical Research at MIT, and in the Science and Technology Studies program at Harvard University. Major thrusts of his lab involve gene editing and cell engineering of human cells found in the retina, central nervous system and blood.